After my latest trip to north GA I have become 99% certain that my gggg-grandparents are buried at Bethlehem Baptist Church Cemetery in Lower Young Cane, GA, just west of Blairsville (Union Co). I will never be able to prove it, for certain. But a considerable amount of evidence has come to light in regards to the locations of their children's farms during the 1830's and 40's, and where John and Margaret lived in relation to them during that time. John and Margaret (J&M) did not own their own farm, by the way. So that effectively removes a family cemetery from the equation. In 1840, the last census on which John was recorded, they were living next to Isabella Price. But Isabella wasn't even buried in a family cemetery, as she was later buried at Bethlehem Cemetery also. All of these family lots (Amos, George, Joseph, plus Isabella) in Lower Young Cane were within a mile or two of Bethlehem, and a couple were within a half mile. In fact, the lot which was the furthest away was Isabella's lot, but she was later buried at Bethlehem. Isabella was not a daughter of John and Margaret, but she was apparently close to them. My g-gf was Elijah Patterson (1871-1957). He is buried at Bethlehem Cemetery (BC). His parents were Bill and Betty Patterson (Wm H. Patterson, 1832-1883, and Elizabeth Akins Patterson, 1836-1914). Both Bill and Betty are buried at BC - next to Isabella Price. Bill's father was George Patterson (1800-1860)... I now know that George died in 1860 sometime between July when the census was taken, and December when his widow Sophia wrote a letter to her family regarding his death. He was buried a couple miles north next to his wife Rebecca Chastain Patterson, who had died during the mid to late 1840's when they lived on a lot in Ivy Log. George later lived very close to BC, and I found out this week via telephone that George attended Bethlehem Church. Logically, he chose to be buried next to his wife, and therefore he is not at BC. My gggg-gf was John Patterson (1762/65-1840's), father of George. John and his wife Margaret, are the first generation of Pattersons whom I do NOT know where they are buried. Bethlehem Church was established in 1848. Usually, churches were established by like-minded people in a growing locale, and quite often established near a cemetery already in use by the community or one of the families. I now know that John could have been born as early as 1762 and no later than 1765. I believe it was around 1762/63 time frame. BC has at least 30 unmarked graves (field stones with no markings on them) in the heart of the cemetery. And the main Patterson (and Price and Gray) rows are located all around these unmarked graves at the entrance to the cemetery. White folk began moving into the area in the late 1820's and early 1830's, so none of these graves would likely pre-date 1830. Where were John and Margaret Patterson buried? Where was their oldest son Joseph B. Patterson (1789-1860) buried? Where was Joseph's daughter, Peggy, and her husband, Gravet E. Foster, buried? Some years ago, a lady named Frances Ebbs Johnson wrote a letter to Mr. Johnson, of Harrison Repository fame. This info sheds more light on the Harrisons and Granthams and Johns of Buncombe, relatives of my Pattersons. Nathan Thomas Harrison, born 1779, NC or VA and wife Sarah Ogelsby are the ancestors of many in Madison County, NC. Early on he was an itinerant Methodist minister to churches in Old Buncombe County. About 1835 Rev. Nathan and family moved from the Sandy Mush area [wp: Buncombe Co NC, where the Pattersons et al lived] and settled into the Cherokee stronghold of Spring Place, Murray County, Georgia a few years before the Cherokee Removal. Known Children: John Valentine m Jane Bell; Rev. Samuel Robert. m Minerva Bell; Jeremiah m (1) Loucinda Lee (2) __________England; Abraham Pickens m Sarah Watters; Sarah m Dr. Tarver; Nathan m Jane_______; Cecil; Thomas, blind since age 17, m Ann (Lord? ); Mary m Henson Gossage; Margaret m Edward F. Farrington; Rachel m James Madison Ellis, called "Too Dottle Too" by the Cherokee in reference to his red hair and literacy. Possible children were William C. and Lydia m Rev. Joab Humphries. Rev. Nathan m 2nd Nancy (Bailey?) but had no children. Rev. Nathan died 1852 at Spring Place. Nathan’s son Thomas was my great great grandfather. He alone of the brothers remained in Buncombe where he lived on Turkey Creek on property owned by his parents. Thomas and Ann’s known children: Jesse, eldest; Mary A.; Robert m Martha ______; Harriet E. and Martha. Thomas and Ann were living with their son Jesse and his bride at Sandy Bottom in 1850, but 1860 they were living in Polk County, TN with their son Robert, a blacksmith, and his family. Jesse, my great grandfather married Althia Caroline Hawkins, the girl next door on Turkey Creek. She was the daughter of Thomas Hawkins Sr. and Dorothy Worley. Jesse with his 16 year old bride, parents and siblings, moved to Sandy Bottom in 1850 where Jesse was a blacksmith along the Buncombe Turnpike. Children: Harriet Jane m Gabriel Cody; Sarah C. m Adolphus E. Treadway; Julia Ann m Charles Z. Netherton; James Madison m Susan V. Hunnicut; Mary m Frank Randall Treadway; John Frederick m. Rebecca Treadway (my grandparents - see Treadway Ancestry); Lucinda R. m David Wright Reeves; Thomas Jefferson m Emma Elvira Cowan; George Washington m Ana Laura Smith and Allice Belle m John W. Misner. Rev. Nathan Harrison’s parents are unknown. He appears to be connected to several households in the 1800 Buncombe County Census. #1. Thomas and (Eleanor?) Harrison with a household of 14 including several adult males, in the Turkey Creek area. #2. John Harrison m _____(Davis?). #3. Ezekiel John m Lydia (Harrison?). #4. Rev. John Grantham m. Elizabeth Harrison, daughter of Thomas. She is said to have been born in Buncombe 1776 (then Indian country). Their eldest son was Isaiah, which suggests a relationship to the Isaiah Harrison Clan of Virginia, from the book, Settlers By The Long Grey Trail, by J. Houston Harrison. A Thomas Harrison Jr., a prominent manufacturer of Belleville, Illinois gave a history of being born in York District, SC 1779. His father moved to Rutherford Co NC, then settled in Georgia [wp: probably Walton Co, Ga] then in Buncombe and then with others moved to Illinois in 1804. He had a nephew John P. Grantham whose father lived in Montgomery Co. IL (Rev. John Grantham). Probably also connected to these households were Rev. Jeremiah Harrison m Sarah Addington, and Nathaniel Harrison m Sarah Carrell. This was an email I sent out to the Patterson research lists today. I started out with the intent of focusing on the Shatteen name, but ended up falling all over the predominant Harrison influence in the church at Newfound Baptist Church, which is located about 8 miles west of Asheville, NC in the modern town of Leicester, in Buncombe County. Here's the email I sent. You mentioned a few weeks ago that the name Chastain was pronounced "Shatteen" in the early 1800s in western NC. Guess what I just tripped over today? I am now in the final editing process on the minutes of Newfound Baptist Church in Buncombe Co NC (1802-1865, more specifically). This church began in 1802, and my Pattersons and Blacks and the Ponders, et al were all members and early founders of this meeting. Apparently the Harrisons were a big part, also, as we'll come to see in a moment. This writing is extremely difficult to read on some pages, this being one of them. This was from page 4 of Book 1. Daniel Ponder was the uncle of my John Patterson, who also attended this church. John Grantham was married to Elizabeth Harrison, daughter of Thomas Harrison of Buncombe. It seems we now know that John Patterson's mother was a Harrison. I think it very likely that John's mother, Margaret Harrison Patterson, was a sister of this Thomas Harrison. That is not proven, however. And then we have Thomas Snelson, who was the first pastor of Newfound, from 1802-1815. His full name was John Thomas Snelson. His son Joseph Snelson married Rachel Harrison, daughter of Joseph and Margaret Hill Harrison. Joseph's father was Nathaniel Harrison (m. to Rachel ____), one of the witnesses to old Robert "R" Patterson's 1775 will in York Co SC. It is believed by many Harrison researchers, including myself now, that THIS Nathaniel Harrison was a brother to the aforementioned Thomas Harrison, and quite possibly also to Margaret Harrison Patterson, mother of my John Patterson. So Snelson was no longer the pastor after 1815. Interesting.... now that I think about it, 1815 was also the last time my John Patterson was in these minutes of the church. Back to Shatteen.... The original typed transcription I have from the church says Shatteen was from Matheus Creek, but it was a guess at the handwriting. It looks more like Prathus or Prathers to me. I did a quick online search and found that there was a Prathers Creek in old Wilkes Co in the part that became Ashe Co in 1799, and then later in the 1820s or 30s it became Alleghany Co. I'm not sure which Shatteen would have lived there in 1803, but I'm convinced this sister church was Prathers Creek. Again, my John Patterson's son, George (b 1800), later married Rebecca Chastain, daughter of Elijah Chastain. Elijah was a scoundrel and womanizer though, so I know he wasn't the pastor mentioned in 1803. Any thoughts, Barbara - or anyone else? I need to get to Burke county and go through their records. So many of the families who ended up in Buncombe county around my Pattersons on Jenkins Branch were families who had spent the last decade or two in Burke Co.
Also, there was a Benjamin Patterson who received a land grant in Burke in 1792. I need to find out more about him. Was he a brother of my John? Answer: She was the mother of Robert "R" Patterson who died in York Co SC in 1775. She has been hailed as Margaret Donnell Patterson Adams in certain published works, and especially on the Internet. I have also perpetuated that name Donnell, but with a "?" in front of it. I have always said that I didn't know where the name Donnell came from, but I couldn't prove OR disprove it. That has now changed (in 2010), in my opinion. I believe I can disprove it. In other words, I believe I can prove that her maiden name was not Donnell, at least not for the reasons previously assumed. "...As a general rule in those times middle Christian names were not bestowed on children, but were given occasionally to honor the mother or grandmother. The only middle Christian name accounted for in the immediate family of Jeremiah Harrison and Catherine Adams was in the case of their daughter, Lydia Donnell Harrison.... Hence it seems likely that the maiden name of Margaret Patterson-Adams was Donnell..."
Jeremiah Harrison married his first wife in or around Sussex Co DE about 1730, give or take a year. Mr. Hood believed Harrison's only wife was Catherine, but he had missed the fact that Harrison's first wife was Elizabeth Patterson. The "daughter" Mr. Hood names as Lydia Donnell Harrison, was born in the early to mid 1730's. 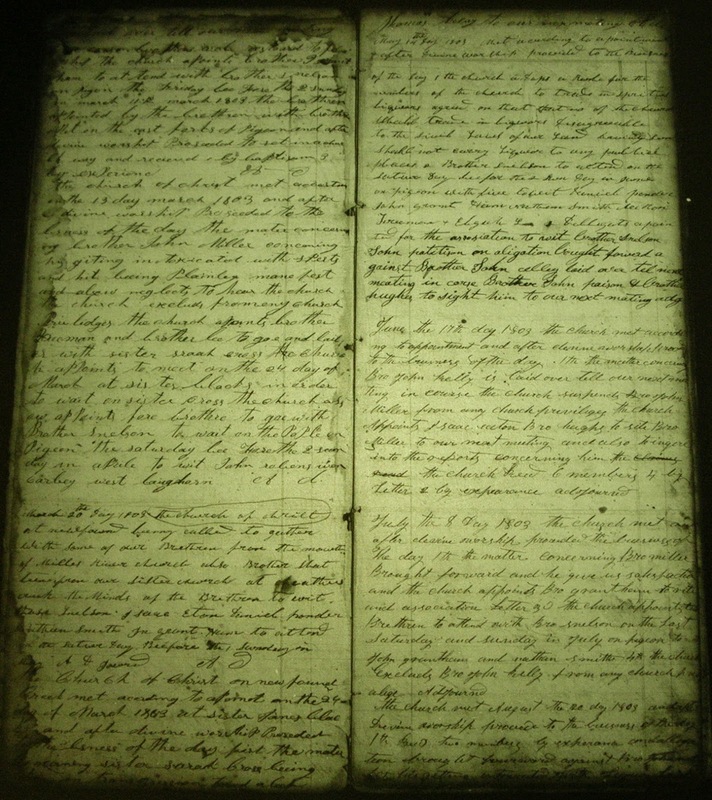 We know that Jeremiah's wife Elizabeth was still alive in 1744 when her mother (Margaret Adams) wrote her will. Elizabeth later died, and Jeremiah remarried to a Catherine, last name unknown. People have always assumed Catherine was an Adams since her "daughter" Esther Harrison was named in Margaret Adams' 1744 will. However, that is another wrong assumption, as Esther was Catherine's step daughter, and the connection was a Patterson connection. In fact, none of Jeremiah Harrison's children (16) descend from the Adams lineage. "Jeremiah Herison, stood sponsor for a child baptized named Lidea Donnel at Halfway House." The key phrase to notice is where it says "stood sponsor". In all other baptism records for children in Rev Craig's diaries, it names the father then the child's name, but no such phrase like "stood sponsor". To me, this proves that Lydia Donnell was named just that - and not Harrison. She may have been raised by the Harrisons. Perhaps Jeremiah became her guardian, but she wasn't a Harrison by birth. With that in mind, I'm afraid it renders Mr Hood's assumption utterly baseless. Remember, his declaration of Margaret Patterson-Adams' maiden name being Donnell was based on this girl being named Lydia Donnell Harrison and her being the daughter of Jeremiah Harrison and his wife, which we know now to have been Elizabeth Patterson. "15th May, 1770. Samuel Adams, of North Carolina, to Joseph Dictum, power of attorney to convey 340 acres on Linvel's Creek, devised by Margaret Adams and from him descended to Samuel as eldest son and heir, having been patented in the name of Mary Adams. Title yet to be made to Samuel." However, we have learned in 2018 according to Thomas Jefferson's Memorandum Books that there was a court case involving Margaret Adams' land that cleared up the fact that the name "Mary" was in error. Her name truly was Margaret Adams - not Mary Adams. Therefore, we believe that her name was Margaret ______ Patterson Adams. I can no longer record her maiden name as "?Donnell". I have that info in many places and this is my first attempt at explaining what I consider to be an error. Things like this happen. We all try to uncover hidden clues. But this is a great example of an assumption gone awry. Hope this makes sense, and perhaps helps clarify some of the mystery surrounding this lady. Margaret Adams (as she was known most of her life) was my 7x-Great-grandmother. P.S. Jeremiah Harrison, and the Pattersons and Adams families, all came from Sussex Co DE to the Shenandoah Valley of Va in the late 1730's. What many researchers did not know until the last few years is that Jeremiah Harrison was first married to Elizabeth Patterson, daughter of Margaret Adams. Margaret was first married to William Patterson, and they were the parents of Elizabeth and Robert (d. 1775 SC). Thereafter, William died and his widow then remarried to John Adams, who likewise died in the 1720's.